This room now houses an 8' X 6' wooden loom and other items used in making fabric, but when the Colby families lived here it was a bedroom. Each piece of the handmade loom is marked with roman numerals so it can be assembled or disassembled. 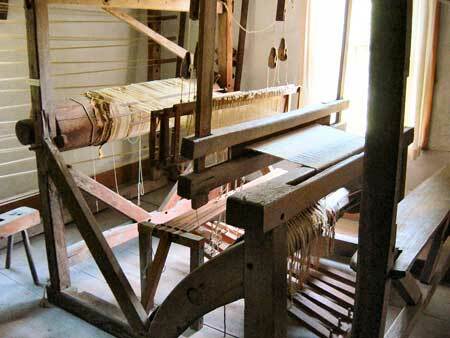 The loom pictured on the left is called a barn loom because of its size. 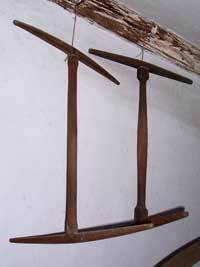 There were a variety of yarn winders (three shown below), all of which held skeins of yard for weaving. 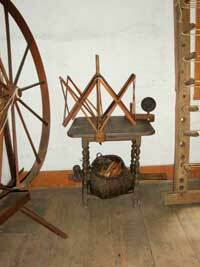 With the 'weasel' or clock reel winder, the yarn was wound around the spoke wheel and the internal ratcheting mechanism clicked with each rotation. 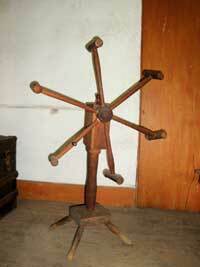 The weight of the yarn would cause the internal mechanism to "pop." This nickname weasel comes from the popping sound, as in the old English nursery rhyme, Pop Goes the Weasel.